November is a month when everything changes in the garden. Temperatures drop, the first ground frosts appear. Trees and shrubs reveal their skeletons as leaves disappear from branches, covering the ground below in a wonderful mass of gold and red. For gardeners, it is a call to action. Although a beautiful sight, those leaves can prove hazardous once they start to decay. Slips and falls can result. Another factor is that those same leaves can make very nutritious compost. Rake up the leaves into piles. Watch out for hedgehogs that may have made a winter nest among any deep drifts. Do not disturb them as they will help deal with pests in your garden next year. Create a compost net to hold the leaves by forming wire netting into a square held securely at each corner by canes. Placed inside the netting and covered with an old carpet, the leaves will rot down quickly. By next spring they will be ready to be used on the garden as fertiliser. Smaller quantities of leaves can be added to a normal compost bin. Place rooted cuttings and seedlings into a cold frame or greenhouse where they can be protected from the weather. Keep doors and windows closed during cold spells. Ensure that you have fleeces and cloches ready to place on tender crops or cherished bushes and trees such as Almonds as temperatures fall. In the vegetable plot, remove any decayed vegetation as this can harbour diseases. Place the material in the compost bin. 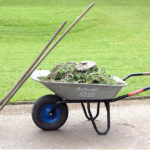 Clear the ground and give it a thorough dig over to remove any perennial weeds. Add manure or any other fertiliser and dig into the soil. During the winter it will have time to break down and improve the condition of your vegetable plot ready for planting again next spring. Regularly weed any over wintering crops. Harvest root crops such as carrots and parsnips as required. On warm days, it is still possible to plant winter flowering pansies or the last few bulbs to cheer up the garden over winter and early spring. The last Michaelmas daisies will continue to bloom and the first flowers of winter flowering shrubs such as winter jasmine and winter honeysuckle will begin to emerge.